· GUARANTEED ORIGINAL PRESSING ON DARK-BLUE LONDON STEREO LABEL WITH WITH “BOXED” (FRAMED) LONDON LOGO, SILVER PRINT AND “STEREOPHONIC” BANNER ACROSS THE LABEL’S CENTER (MID-TO-LATE 60’s STYLE) (NO OTHER ‘60s STEREO PRESSINGS EXIST). · TO THE BEST OF OUR KNOWLEDGE, THIS IS THE ONLY ALBUM ON WHICH THE GROUP FEATURES FOUR (4) LEAD AND/OR RHYTHM GUITARISTS: BRIAN JONES, KEITH RICHARD, MICK TAYLOR AND RY COODER. RUMOURS HAVE IT THAT ERIC CLAPTON LENT HIS SERVICES AS WELL, BUT THIS COULD NOT BE CONFIRMED AND IS PROBABLY ONLY A RED HERRING. · FAIRLY THICK VINYL PRESSING On the scale from 1 to 10 (1 being the least, and 10 being the most severe), we assess the thickness of the vinyl as 7. Mostly recorded without Brian Jones — who died several months before its release (although he does play on two tracks) and was replaced by Mick Taylor (who also plays on just two songs) — this extends the rock and blues feel of Beggars Banquet into slightly harder-rocking, more demonically sexual territory. 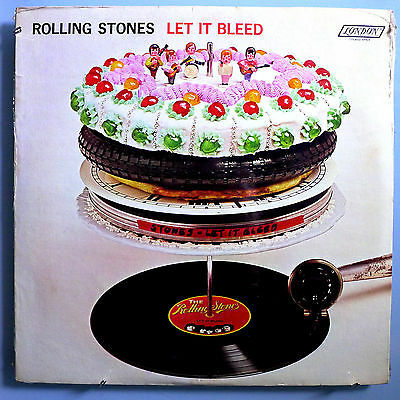 The Stones were never as consistent on album as their main rivals, the Beatles, and Let It Bleed suffers from some rather perfunctory tracks, like "Monkey Man" and a countrified remake of the classic "Honky Tonk Woman" (here titled "Country Honk"). Yet some of the songs are among their very best, especially "Gimme Shelter," with its shimmering guitar lines and apocalyptic lyrics; the harmonica-driven "Midnight Rambler"; the druggy party ambience of the title track; and the stunning "You Can't Always Get What You Want," which was the Stones' "Hey Jude" of sorts, with its epic structure, horns, philosophical lyrics, and swelling choral vocals. "You Got the Silver" (Keith Richards' first lead vocal) and Robert Johnson's "Love in Vain," by contrast, were as close to the roots of acoustic down-home blues as the Stones ever got. For its extraordinary contribution to the modern music, superb production, craftsmanship, fine musicianship, revolutionary significance and influence it exerted on numerous generations of musicians, writers and general public, or for some other innate quality, this album was voted one of top-200 albums of all time in one of the largest poll of critics, music reviewers, professionals and producers ever organized: the poll, which was conducted by Paul Gambaccini, legendary BBC Radio A&R man, surveyed more than 50 top music professionals (including Roy Carr, Jonathan Cott, Robert Christgau, Cameron Crowe, Chet Flippo, Ben Fong-Torres, Charlie Gillett, Greil Marcus, Murray the K., Lenny Kaye, Bruce Morrow (a/k/a "Cousin Brucie"), Tim Rice (of "Jesus Christ Superstar" and "Evita" fame), Lisa Robinson, Robert Shelton (who wrote liner notes for Bob Dylan's first album), Ed Ward, Joel Whitburn, Pete Wingfield, etc.). For more details, see: "Critics Choice: Top-200 albums" compiled by Paul Gambaccini, Omnibus Press, Library of Congress Catalog No.7855565 (or ►click here for the complete album listing). (a) The album may or may not come with its original poster still intact (we do not know for sure). (b) The record comes in its original, custom, inner sleeve, which is UNIQUE to this album. (d) US Mono pressings of this album are NOT known to exist.